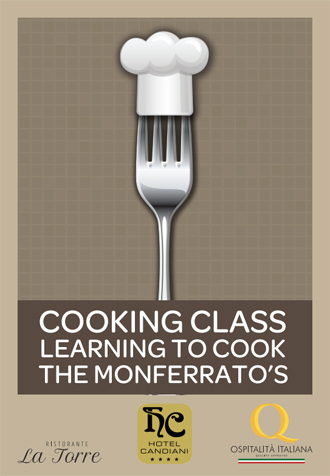 While you are in Casale, don't miss the chance to immerse yourself in the rich cooking tradition of the region of Monferrato. Hotel Candiani, in cooperation with Restaurant La Torre, features cooking lessons for guests who want to learn some of the traditional flavors and recipes of Monferrato. We might make Bagna Cauda, the famous Piemontese dipping sauce made with anchovies and garlic. Or maybe Agnolotti Piedmontese and Monferrato Pumpkin Cake. The menu varies depending on the season and the preferences of our guests. And after we cook, of course, we eat! The meal is served to the cooks, who will taste their own work. Our minimum half-day lessons are for everyone from beginners to professionals. And they are in English. The base price is 25 eu, per person. Groups from 5 to 15 people. Go for it! Come on in the kitchen! !